You can use the AutoToolTipPlacement property to automatically show a tooltip on a slider while the thumb is being dragged. The tooltip will show the current Value of the slider. You can set AutoToolTipPlacement to either BottomRight or TopLeft to control the position of the tooltip. (The default is None). Note, however, that the value shown in the tooltip is by default rounded to the nearest integer. You can see this in the example below, as we display the actual Value in a TextBlock. You can increase the precision shown in the tooltip by setting the AutoToolTipPrecision property. You set this property to be the number of digits to the right of the decimal place that you want to see. 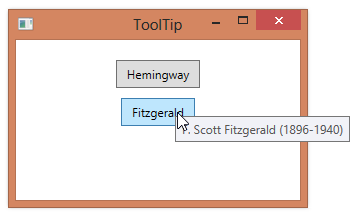 Both Tooltips and Popup controls allow you to display a small popup window that contains some content. Which one you use depends on what you need to accomplish with the popup window. The ToolTip control is one of the few controls whose content is not clipped at the boundary of its container. In fact, it can extend beyond the boundaries of an application’s window. By default, a tooltip will not be shown if you hover over a control that is disabled. This makes sense–if you can’t interact with a control, you probably don’t need to see whatever additional information the tooltip is providing. (Although you might make the argument that a tooltip could provide information about why a particular control is disabled). In the code below, the first button has its IsEnabled property set to false, which means that its tooltip won’t be shown when you hover over it at runtime. If you do want the tooltip to be displayed when the parent control is disabled, you can set the ToolTipService.ShowOnDisabled property to true. The TooltipService.InitialShowDelay allows you to set the amount of time that passes between when you first hover over a control and when a tooltip pops up. This value defaults to 400 ms (0.4 secs). 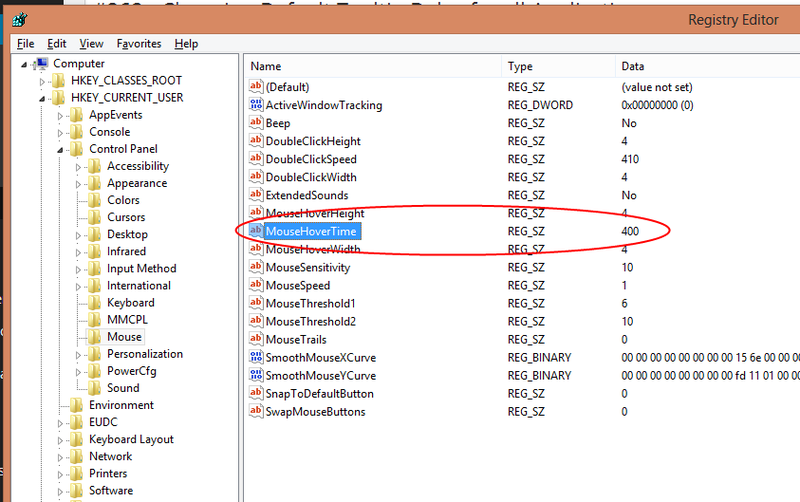 This default value actually comes from a registry setting–MouseHoverTime–that dictates this delay for all applications. You can change this registry setting by entering a new value for the delay (in milliseconds). You’ll need to log out and back in before the setting will take effect. If you change this setting, applications that do not explicitly specify a value for InitialShowDelay will pick up the new value from the registry. Applications that explicitly set a value for InitialShowDelay will still use their explicit value. 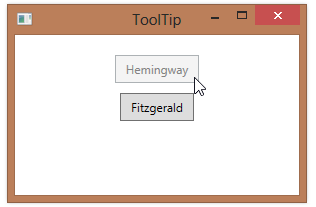 Several properties of the TooltipService class affect timing of tooltips displayed for a control.